For other uses, see You've Got a Friend (disambiguation). 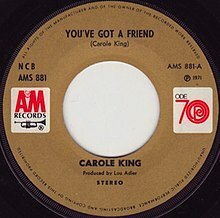 (1971) "You've Got a Friend"
(1971) "Long Ago and Far Away"
"You've Got a Friend" is a 1971 song written by Carole King. It was first recorded by King, and included in her album Tapestry. Another well-known version is by James Taylor from his album Mud Slide Slim and the Blue Horizon. His was released as a single in 1971 reaching number 1 on the Billboard Hot 100 and number 4 on the UK Singles Chart. The two versions were recorded simultaneously in 1971 with shared musicians. "You've Got a Friend" won Grammy Awards both for Taylor (Best Male Pop Vocal Performance) and King (Song of the Year). Dozens of other artists have recorded the song over the years, including Dusty Springfield, Michael Jackson, Anne Murray and Donny Hathaway. "You've Got a Friend" was written by Carole King during the January 1971 recording sessions for her own album Tapestry, and James Taylor's album Mud Slide Slim and the Blue Horizon. King has stated that "the song was as close to pure inspiration as I've ever experienced. The song wrote itself. It was written by something outside myself, through me." According to Taylor, King told him that the song was a response to a line in Taylor's earlier song "Fire and Rain" that "I've seen lonely times when I could not find a friend." King's album was recorded in an overlap with Taylor's, and King, Danny Kortchmar, and Joni Mitchell perform on both. The song is included on both albums; King said in a 1972 interview that she "didn't write it with James or anybody really specifically in mind. But when James heard it he really liked it and wanted to record it". Taylor's version was released as a single, and reached number 1 on the Billboard Hot 100 and number 4 on the UK Singles Chart. The James Taylor version also spent one week at the top of the Easy Listening charts. Billboard ranked it as the No. 17 song for 1971. James Taylor and Carole King performed "You've Got a Friend" together in 2010 during their Troubadour Reunion Tour. In 2015, Taylor performed an acoustic rendition of the song at Hôtel de Ville, Paris at the invitation of U.S. Secretary of State John Kerry and Paris mayor Anne Hidalgo in tribute to the victims of the January 2015 Île-de-France attacks. According to author James D. Perone, the song's themes include an expression of "a universal, sisterly/brotherly, agape-type love of one human being for another, regardless of gender." The "reassuring" lyrics have long made the song popular with lonely people needing a boost of self-confidence. The song's messages of friendship having no boundaries and a friend being there when you are in need has universal appeal. For Taylor the lyrics had particular resonance due to the depression he had recovered from shortly before hearing King play the song. The music moves between a major and minor key, which according to music critic Maury Dean gives the song a "sympathetic mood." In his review of Tapestry, Rolling Stone critic Jon Landau called "You've Got a Friend" Carole King's "most perfect new song." He particularly praised how the melody and lyrics support each other, and the "gorgeous, righteous rock melody" of the ending lyrics. Mojo considered the song to probably be "the core of Tapestry. Allmusic critic Stewart Mason commented on the "plainspoken intimacy" of King's performance. Mason finds that the "shyness" of King's voice gives her recording of the song a sincerity that he finds Taylor's to lack. Mason also praises the "depth and shading" provided by the string instruments on King's recording. In his review of Mud Slide Slim and the Blue Horizon, Rolling Stone critic Ben Gerson described "You've Got a Friend" as an "affirmative song," but suggested that James Taylor's version was too similar to Carole King's original version to have been worth including on his album. Music critic Maury Dean describes Taylor's performance style for the song as minimalist and folkish and comments on his "star-spangled sincerity." Dusty Springfield recorded the song in early 1971 during the sessions for her third Atlantic Records album Faithful. Her recording predates that of James Taylor, but it was shelved until 1999 when it was included as a bonus track on the 1999 Deluxe Edition of her first Atlantic album, the critically acclaimed Dusty in Memphis (which contained four Carole King compositions). Faithful went unreleased due to disputes between Springfield and Atlantic but the sessions were eventually issued as a standalone album in 2015. The song was recorded by Roberta Flack and Donny Hathaway for their 1972 album Roberta Flack & Donny Hathaway, and was released as the album's first single. 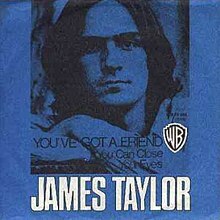 The single was released a year before the album was, and coincidentally was released on the same date as James Taylor's single: May 29, 1971. The Flack and Hathaway version reached #29 on the Billboard Hot 100, and #8 on the R&B chart. In approximately 1973 or 1974, the song was covered by Cambodian singer Pou Vannary with the lyrics translated into Khmer. Vannary's rendition is featured in the soundtrack to the 2015 documentary film Don't Think I've Forgotten. The song was recorded by The Brand New Heavies for their 'Shelter' album in 1997 and was the third single to be released from the album, it reached #9 on the UK Singles Chart in October 1997. "You've Got a Friend" was performed by Celine Dion, Shania Twain, Gloria Estefan, and Carole King at the VH1 Divas Live concert in Beacon Theatre, New York, 1998. It was released as a single and reached number 74 on the Belgian Flanders Airplay Chart. In 2004, English R&B singer Javine released her cover of the song as half of a double A-side single, along with a cover of "Don't Walk Away". Her recording was included in the soundtrack for the 2004 film Garfield. In 2005 British pop rock band McFly's cover of this song charted at number one in the UK Singles Chart This was released as a Double-A side along with the band's song All About You. This was also the official 2005 Comic Relief single. In 2016 Raini Rodriguez covered the song in the Austin & Ally episode "Musicals & Moving On". Christina Aguilera and Alisan Porter covered the song in The Voice season 10 finale. ^ a b "Tapestry". The Mojo Collection (4th ed.). ^ "James Taylor: My Life in 15 Songs". Rolling Stone. August 13, 2015. pp. 23–25. ^ White, T. (August 4, 2015). "James Taylor Looks Back on His Classics". Easy 93.1 FM. Retrieved 2015-08-10. ^ Harvey Kubernik (2008). "Troubadours - Carole King's Monumental Tapestry Album | American Masters | PBS". pbs.org. Retrieved 20 March 2013. ^ Megan Gibson (2015-01-16). "Watch James Taylor Sings "You've Got a Friend" with John Kerry". Time.com. Retrieved 2016-07-20. ^ Perone, J.D. (2006). The Words and Music of Carole King. Greenwood Publishing. p. 40. ISBN 9780275990275. ^ a b Halperin, Ian (2003). Fire and Rain: The James Taylor Story. Citadel. pp. 128–129. ISBN 978 0806523484. ^ White, T. (2009). Long Ago and Far Away. Omnibus Press. p. 190. ISBN 9780857120069. ^ a b c Dean, M. (2003). Rock 'n' Roll Gold Rush. Algora. pp. 254–255. ISBN 0875862071. ^ a b Landau, J. (April 29, 1971). "Tapestry". Rolling Stone. Retrieved 2014-04-13. ^ a b c Mason, S. "You've Got a Friend". Allmusic. Retrieved 2014-04-22. ^ Gerson, B. (June 24, 1971). "Mud Slide Slim and the Blue Horizon". Rolling Stone. Retrieved 2014-04-13. ^ "The Irish Charts – Search Results – You've Got a Friend". Irish Singles Chart. Retrieved January 14, 2018. ^ "James Taylor: Artist Chart History". Official Charts Company. Retrieved November 30, 2018. ^ "James Taylor Chart History (Hot 100)". Billboard. Retrieved November 30, 2018. ^ Whitburn, Joel (1993). Top Adult Contemporary: 1961–1993. Record Research. p. 237. ^ "Cash Box Top 100 8/07/71". tropicalglen.com. ^ Whitburn, Joel (2004). Top R&B/Hip-Hop Singles: 1942-2004. Record Research. p. 206. ^ Scheck, Frank (22 April 2015). "'Don't Think I've Forgotten: Cambodia's Lost Rock and Roll': Film Review". The Hollywood Reporter. Retrieved 31 July 2018. ^ Pirozzi, John (director, producer), Andrew Pope (producer) (2015). Don't Think I've Forgotten (film) (in English and Khmer). Argot Pictures. ^ "Home Design ~ officalcharts". www.officalcharts.com. ^ Jaspers, Sam (2006). Ultratop 1995-2005. Book & Media Publishing. ISBN 90-5720-232-8. "Don't Walk Away/You've Got a Friend"